I haven’t received the Sunday paper for a few years now, but today made me think of Garfield and how on occasion, he would grumble about how similar Tuesday is to Monday. I personally, don’t have an opinion either way, but I cant help replaying the comic strips I remember over and over in my head today and here’s why: my coat and keys were taken by mistake this morning. I am a member of the Sunrise Rotary Club in my community and we have about 125 members (give or take). We meet early on Tuesday mornings, which is lovely for me since most of my classes are in the evening. On colder days, the conference center that serves as our meeting place, often puts out metal racks to hang coats. Our morning meeting had its share of information and laughs and at the end as everyone was making their way out, I turned to the coat rack to find it missing mine. While it was snowing and fairly chilly outside, I wouldn’t have sweated it too much (I’m a pretty tough cookie), but my keys (house, car, studio) were in the pocket. My next class beginning in 45 minutes across town and me with no way to access anything. I then began to look around and see if anyone’s coat looked familiar. One of the members saw me looking around and inquired. Upon hearing what had happened, she told me she was off of work that day and could give me a ride somewhere if I needed it. So at least I could leave the conference center, but where to? I wouldn’t be able to access anyplace else, even my house. We assessed what probably happened was the person mistook my coat for theirs, as there was another coat hanging up of similar color and length. The whole scenario took a little over an hour to sort out and get the rightful items to the right people and everyone on their way. And as it was unfolding I kept thinking about Abraham Maslow and the Yamas (and Garfield too ). 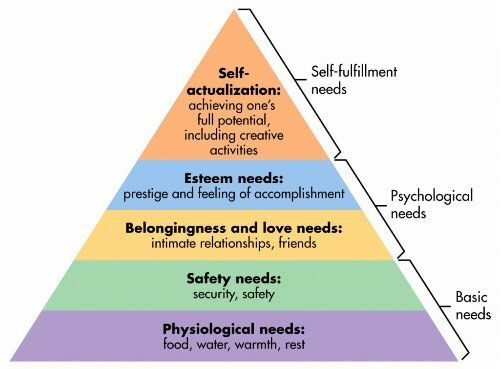 Abraham Maslow was an American psychologist who developed the Hierarchy of Needs Pyramid (pictured). His theory walks through the needs of a person and how once those needs are fulfilled, how our mind can expand to handle a different set of needs, up to the point of Self-Actualization (although before he died he was working on a level above self actualization called, self transcendence). In the picture, the foundation is established with basic physical needs like food and warmth. Each level adds a new dynamic to the ability to live and strive. What is interesting about this pyramid, is two-fold; 1. We as a species tend to work in an upward direction naturally. 2. An individual (or even a society) can move up and down the pyramid. For example, lets say you are a tenured college professor. You have a family, a comfortable home and some job security. You are very knowledgeable in your field and colleagues and students come to you for your sound guidance. One Spring, a storm comes through and a tornado destroys your home. Your family is safe, but you no longer have a place to live. Later in the same day, someone comes to you for some of your sound advice. Do you think the advice you give or even the energy around the advice will be of the same substance it would have been two days prior to the storm? Where would your head be? Maslow discusses when our foundations are shifted in a substantial way, our mind changes to handle the pressing need. A smaller example of this is, the phrase, ‘hangry’. Often defined as, ‘so hungry you’re angry.’ You typically can recognize when this is occurring in yourself because you recognize the physical feelings of hunger. Once your hunger is satisfied, you are then able to function at a higher level. You might even have experienced a person who lost their job unexpectedly. Think for a moment, how they changed or acted differently when that occurred. Here’s the next piece. In the situation of the friend losing their job; if they found a job of equal pay or status, did their attitude and demeanor return? Where they once again the person you knew and were familiar with? Did this shift in them happen quickly? 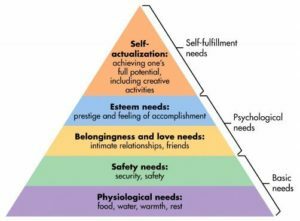 Maslow believed once you ‘level up’ on the pyramid, if a foundational level is affected (job loss, home destroyed, hunger, etc), it is easier for us to return to our highest level of function once the impacted level is resolved. Also, some individuals will never achieve Self Actualization and others may achieve it very easily. When my coat was taken, I felt as though I was stranded and unable to meet the needs of my schedule, I began to observe myself being very uncomfortable and some of that discomfort was making me feel upset. What level was being impacted the most? Probably Esteem, I had a class I needed to be at, but also, not having access to my home was poking at my security needs. Now, I knew I could get a hold of my husband to let me in the house, but at the moment, I didn’t know where he was or if he would be able to answer the phone. At the same time, the people around me were trying to be gracious with their help. In yoga, we talk about the yamas, sometimes called the ‘Dont do’ list. The first element of the yamas is ahimsa, the action of non-violence (love in action). Was I going to become violent? Of course not, but what if my words with the other members of my club were, ‘SOMEBODY, stole my coat!’ as opposed to what I actually said, which was, ‘someone grabbed my coat by mistake.’ I knew the person didn’t intentionally take it. I also knew, they were probably going to feel bad knowing they caused another person an inconvenience. As I moved through this morning’s experience, I kept thinking about how this is my practice in action. All the sun salutations, focusing on breath, the meditation work, they are all lining myself and others up so we may begin to activate these tools during as we encounter sudden shifts in environment. And even as the solution resolved itself and the end was near, even now as I tell the story, I’m still practicing my yoga. Yoga is a mindful practice, a lifestyle that can extend into a physical one. Not the other way around.